Recent discs from La Nuova Musica (on Harmonia Mundi) and Jochewed Schwarz & Emer Buckley (on Toccata Classics) give us a snapshot of the way Francois Couperin and his contemporary Sebastien Brossard combined the French and the Italian taste in their works. 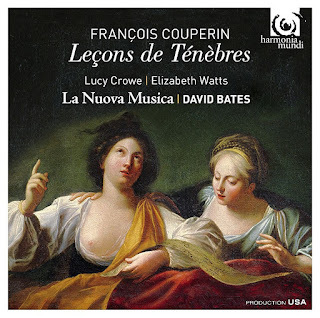 David Bates and La Nuova Musica perform Couperin's Trois Lecons de Tenebres (with Lucy Crowe and Elizabeth Watts) plus Brossards trio sonatas and Stabat Mater, whilst Schwarz and Buckley perform Couperin's late suite Les Nations on two harpsichords. Much ink was spilled in the late 17th century and early 18th century on the differences between, and importance of, the French and Italian styles in music. At first, it seems incredible to us that such details could matter so much, and we are rather with the composer Francois Couperin who wanted to unite the two tastes (amongst his last works was Les gouts reunis). For the 18th century the arts were political, part of a ruler's armoury. So recast the the controversy into more modern issues of inclusion/exclusion, national/international and we can see that we continue to have similar arguments. Politics was at the centre of the controversy; the Fronde in France (civil wars from 1648-1653) was partly because of the pro-Italian policies of Queen Anne (the Regent), and Cardinal Mazarin (her political advisor). When the young Louis XIV took the reins of power in 1661, it was politically expedient to repudiate anything Italian, and that included music and the arts. Italian composers, including Cavalli, were sent home, and native composers encouraged to develop a French national style (ironically, in opera the leading light was Jean-Baptiste Lully who was Italian born). As the controversy bobbled on, not every French composer was obsessed with French style. Sebastien Brossard had greater access to Italian scores because he lived in Strabourg, close to the German border. On their new disc from Harmonia Mundi, David Bates and La Nuova Musica use Brossard's trio sonatas to punctuate their performances of Couperin's Lecons de Tenebres, which makes a nice mix of styles. Couperin's Lecons de Tenebres, written for nuns of the abbey of Longchamp, adhere to French taste. But their use of a solo soprano to sing expressive recitative, harks back to Monteverdi as well as giving a nod to Lullian tragedies lyriques. David Bates chooses to give one solo Lecon to each of his sopranos, Lucy Crowe and Elizabeth Watts, with the two combining in the final Lecon. The results are magical, Crowe and Watts sing with great style but with a nice contrast in approach. Crowe is plangent and coolly elegant, whereas Watts brings more warm passion, though both execute the music with superb period style. And needless to say, the final Lecon with both of them is pure magic. You have to accept a larger scale, more operatic approach than some might want, this is to a certain extent French baroque music re-invented and some will prefer a more purist approach. Brossard's Italianate trio sonatas make finely elegant punctuation points, and Bates rounds off the disc with a passionate and stylish account of Brossard's Stabat Mater. Performed by the choir of La Nuova Musica, this is again a large scale interpretation of the work, sung with gusto and elan but some might prefer the smaller vocal ensemble approach. By contrast Jochewed Schwarz and Emer Buckley explore the more intimate Couperin, but in a rather different form than usual. On a pair of discs from Toccata Classics they perform Couperin's Les Nations and other works, in versions for two harpsichords. 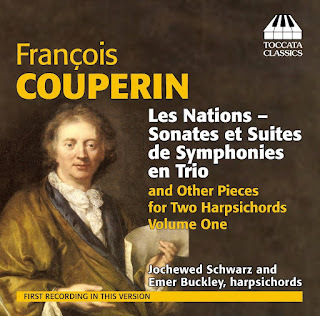 Couperin published his suites Les Nations in 1726 as trio sonatas for two melodic instruments and harpsichord. This was a period when Couperin, now quite elderly, was publishing syntheses of both styles (his Les gouts reuinis dates from 1724) Le Nations combines French and Italian taste, each of the Sonatdes et Suites de Simphonies of Les Nations opens with an Italian sonata, followed by a French dance suite so we find the elderly Couperin still balancing the two styles, showing that each is equally valid. In his preface to another work in trio sonata form, L'Apotheose de Lully, published the year before Les Nations, Couperin explains how it is possible to play the music on two harpsichords and that he in fact does so at home. Each harpsichordist takes one of the melody lines and both play the bass part. The result is intriguing and perfectly in keeping with Couperin's view of flexible scoring. Schwarz and Buckley play on a pair of well matched harpsichords in the Von Nagel harpsichord workshop in Paris. Their touch is well matched too, so that you can enjoy the richness of the two-harpsichord experience, with vivid interplay and a nicely balanced view of ornamentation. You don't need to know about the controversies surrounding le gout Francais and le gout Italien in the late 17th and early 18th centuries, but it helps to illuminate. All these discs would be delightful listening if heard blind, but knowing the concerns of the composers helps to expand our view of the music. Available from Amazon.co.uk - volume one, and volume two.